A spritely score, as enchanted as the Hundred Acre Wood itself. Where’s the Winnie the Pooh theme song?! Great soundtrack..but iconic piece of music missing? So the soundtrack is really well done and I absolutely loved this movie. But for some strange reason or another. 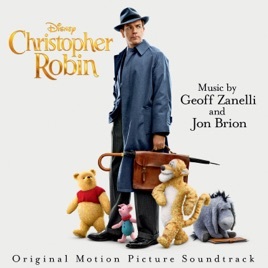 It seems that the somewhat slow, haunting, but all too familiar underscore of the Winnie the Pooh theme we all know and love, that plays in some parts of the film, including the end credits, is completely missing from the official soundtrack release. I’m really confused by this... Is it hidden in one of the other tracks or am I just not finding it? How this happened, I’m not quite sure... but I’d really hope this is fixed or officially uploaded online by Disney so we can hear it. I’m just kinda dumbfounded that they wouldn’t include such an iconic theme here. Absolutely magical & brilliantly done!